There’s no greater compliment than repeat customers who come back for work on their new cars. 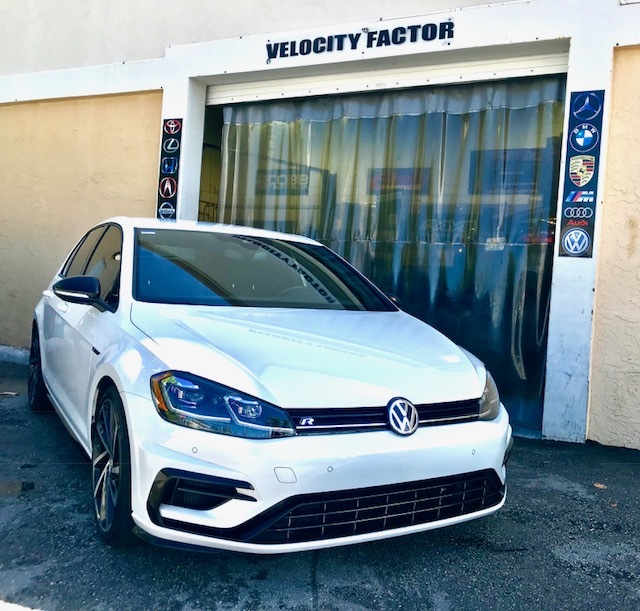 In this particular instance, our customer with this beautiful 2018 Volkswagen Golf ‘R’ previously came to Velocity Factor with his BMW X5 3.5is to which we did a number of upgrades. When it came time for the customer to move on to a different vehicle, he chose the excellent Golf ‘R’ platform from which to begin a new journey. With performance being the first priority, there was no doubt of what company’s products to choose from and of course we went with Unitronic! In terms of power, reliability, and consistency Unitronic has proven time and again to be the #1 tuner for Volkswagen and Audi vehicles. Starting from an excellent platform with the Golf ‘R’ made it even better. A Stage 2 package was put together consisting of a Unitronic Stainless Steel Downpipe with high-flow catalytic converter which also comes with a Unitronic Stainless Steel mid-pipe. Next up was a Unitronic Front Mount Intercooler System which mounts and fits perfectly every time without the need for any cutting or trimming, while retaining the factory’s bumper support beam. Topping off the list is the unbelievably beautiful and precision-engineered Unitronic Carbon Fiber Cold Air Intake which is equal in looks and performance alike. Of course, the most important piece to the Stage 2 package is the software and where Unitronic is leaps and bounds above all others. A Stage 2 ECU Upgrade designed to take full advantage of the Unitronic Downpipe, Front Mount Intercooler, and Carbon Fiber Intake was programmed onto the vehicle. Along with this the Unitronic Stage 2 DSG Software was installed for a higher launch control setting, increased clamping power, and enhanced gear shifting that is 3x faster than stock. The end result is 400 Horsepower that is reliable and consistent, along with 370 ft. / lbs. of torque which completely transformed a great car into an unbelievable one! The wider power band and quicker shifting makes this car incredibly fast, and with the quality of Unitronic’s components and software our customer is rest-assured to have the utmost in consistency and reliability at all times. Needless to say, the customer was thrilled with the results as we were too. Next up is a staged brake upgrade and custom wheels so stay tuned to our blog for an update to this incredible build! If you own a late-model VW or Audi, do yourself a favor and view Unitronic’s website at: www.getunitronic.com or stop by Velocity Factor to speak with our Unitronic specialists. 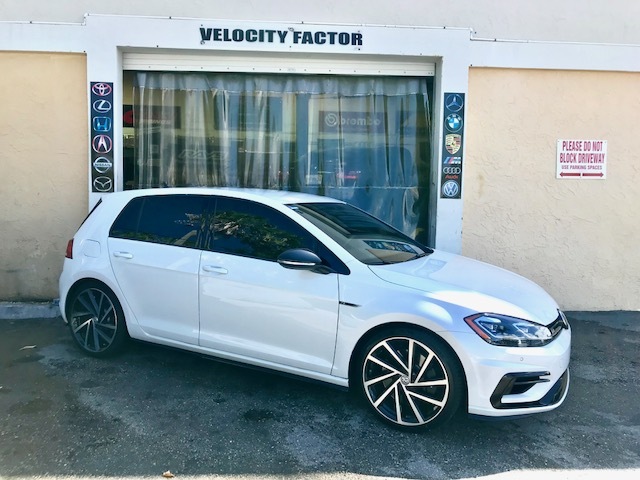 Come visit our showroom located at 980 North Dixie Highway in Boca Raton, call us at (561)-395-5700, or email us at: sales@velocityfactor.net to find out what we can do for your car today. Our business hours are Monday – Friday from 10am to 6pm and Saturdays from 12pm to 4pm. We look forward to hearing from, and working with you in making your vehicle as incredible as it can be here at Velocity Factor!